Ernakulam is a major city and the commercial capital of Kerala. Read the article to know more about Ernakulam. Situated on the coast of Arabian Sea, Ernakulam in Cochin is the commercial capital of Kerala. The city has been named among the best natural harbors in the world. Ernakulam has a long ancient history of receiving Arabs, Chinese, Dutch, British and Portuguese mariners. It is a major tourist destination and is popular for its peninsulas and islands. Ernakulam receives thousands of international and domestic tourists every year. Also known as Mattanchery Palace, Dutch Palace was built by Portuguese in 1555. The palace is known for its murals based on the traditions of Hindu Temple Art. The central courtyard is dedicated to Pazhayannur Bhagavathi, the royal deity of palace. There are two more temples on the sides of the palace, each devoted to Lord Krishna and Lord Shiva. Jewish Synagogue was built in 1586, hence making it the oldest synagogue in the country. The synagogue is situated at Mattancherry and still holds the scrolls of the Old Testament and the copper plates. It was partially destroyed in the war of 1662 and later renovated by Dutch. St. Francis Church is a magnificent church was constructed by the Portuguese in 1510 A.D. and considered as the oldest European church in the country. It is said that the famous traveler Vasco-da-Gama was first buried here and after the span of fourteen years, his remains were moved back to Portugal. Wellington Island is a man made island, designed by Lord Bristow. This beautiful man made creation is surrounded by stunning backwaters and contains the city’s best hotels and trade centers. Bolgatty Island has been named after Bolgatty Palace, which was built by the Dutch in 1744. It was later occupied by the British and became the home for British Governors. Currently, it is a luxurious hotel with a mini golf course and cottages for honeymooners. 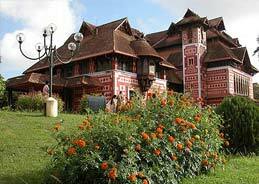 Located 12 km from Ernakulam, Hill Palace Museum is the largest museum in the state of Kerala. The museum contains various types of sculptures and a wide range of rare coins, old weapons and collections belonging to the Royal Family of Cochin. Mangalavanam Bird Sanctuary provides shelter to a variety of migratory birds. The bird population of the sanctuary includes 41 species of birds representing 25 families. This sanctuary also contains many varieties of mangroves. 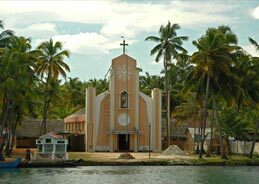 Located 52 km from Kochi, Malayattoor Church is an important Christian pilgrim centre. It is believed that this church was built in 900 AD. The church is at the top of hill and can only be reached only by foot. From Nedumbassery International Airport, which is 20 km from Ernakulam city, one can board flights to major national and international destinations. Ernakulam Junction is a major railway station of the southern railways, which connects the city to many other cities within the state and the country. Ernakulam is well connected to other major cities and towns within the state, by a wide network of buses.